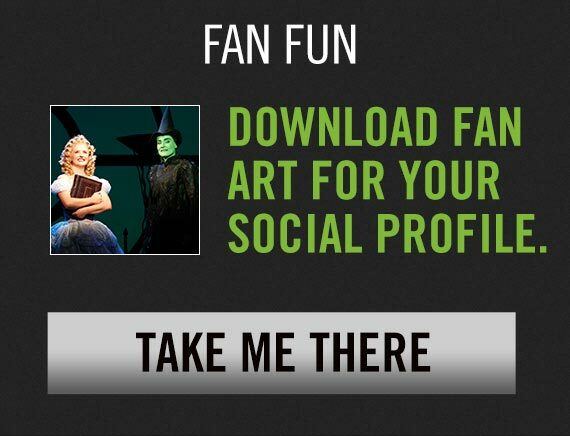 Why not discoverate your WICKED kitchen skills and bake WICKED witch hat cupcakes! These cupcakes are deliciously swankified with orange frosting and licorice pieces! Are you a Wizomaniac in the kitchen? You can find a recipe below to get started or make up your own creation! With the rack in middle position, preheat the oven to 180 °C (350 °F). Line a 12 cavity muffin tray with paper liners. In a bowl, combine the flour, baking powder, baking soda and salt. Set aside. In another bowl, combine the sugar and cocoa. Add the oil, eggs, vanilla and beat with an electric mixer at high speed or until mixture is smooth. At low speed, add the dry ingredients alternately with the milk. Scoop the batter into the molds. Bake for approximately 25 minutes or until a toothpick inserted in the centre of a cake comes out clean. Cool and store in an airtight container. With a pastry brush, generously cover the outside of the mini cones with the melted chocolate. Place the cones (open side down) on a baking sheet lined with parchment paper. Refrigerate for about 10 minutes or until the chocolate is set. On another baking sheet, with a teaspoon, form 5-cm (2-inch) in diameter discs with melted chocolate. Place a cone (open side down) in the centre of each disc. Refrigerate for 1 hour. Top the chocolate cupcakes with orange frosting. 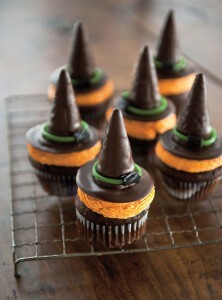 Garnish each cupcake with a witch hat. Wrap a green licorice around the hat to form a cord. Attach pieces of black licorice to the hat’s cords.